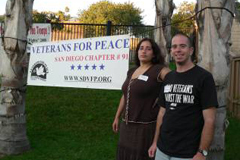 March 7, 2012 (La Mesa)--Tom Skinner, an Army veteran, will depart on Saturday. March 10, 2012 at 9:00 A.M. from the United Church of Christ, 5940 Kelton Avenue, La Mesa on 117-day cross country ride covering over 3,800 miles ending at White River Junction, Vermont the National PTSD Headquarters. January 25, 2011 – Result s of a new study published in the American Journal of Psychiatry have found that 93 percent of soldiers contemplated suicide when they went without aggressive mental counseling in a controlled group. Results of the study, conducted by the Army on 20,000 soldiers in Iraq, shows that 54 percent fewer soldiers contemplated suicide and the number of soldiers who needed to be sent home with mental health problems dropped by nearly 70 percent with more aggressive counseling in the field.